The stunning Sculpture Park and arboretum at Waitakaruru – a stone’s throw from Tamahere – is offering free entry on Boxing Day, December 26. Visitors wanting to enjoy a peaceful, natural environment after the hubbub of Christmas are invited to take a picnic and enjoy the picturesque 17ha with family and friends. A world away from the hectic, post-Christmas store sales, the park’s paths wind around a magnificent garden and arboretum with rocky outcrops, ponds, flowing water and broad vistas. Tamahere School’s new pools will be available over summer to community users who register and pay for passes to the facility. The school has to adhere to a strict safety regime to enable members of the public to use the pool and will trial a system of two passes from January 3 to April 15. Camille Stranks will be at the Tamahere Community Centre, Monday to Wednesday, December 11 to 13, 8-9am, to sign up pass holders. A community carol sing-along will be held at St Stephen’s Tamahere church from 6.30pm this Saturday. The Cambridge Brass Band and other local performers, including ukelele players, will lead the event. It’s a family friendly occasion, the Lions will be operating a barbecue and free parking will be available opposite the church grounds. The second, annual NZ Dirt Jump Nationals freestyle BMX and mountain bike championships is on at the Narrows Park in early December. The event ran for the first time last year with more than 50 competitors thrilling around 350 spectators, said organiser Al Belcher of the Airport Rd Narrows Park. Of the three competition classes for riders from 12 years up, it is the all-age open class that attracts the best freestyle riders in New Zealand, he said. 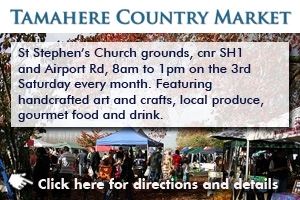 Exactly one month out from Christmas Day, Tamahere will be host to a self-proclaimed “Best Christmas Market”. 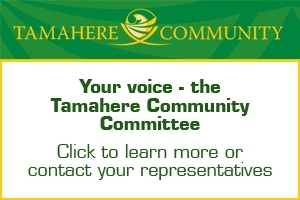 There will be only way to test the claim – get along to the Tamahere Community Centre on Saturday, November 25 between 10am and 2pm. Around 40 stallholders will be vying to solve Christmas gift ideas, mostly mums with small businesses who will be showcasing and selling their artisan goods.